Becoming a wedding planner can be a lot of fun, but it is also a lot of work. Individuals who do well in this field have to be good with people. They must be able to negotiate, plan well, and help with managing the very intricate details that come with planning a wedding. Depending on the area, there are some significant demands for people in this industry who have skill and knowledge of the latest trends and fashions. Before beginning to work as a wedding planner, individuals should learn as much as they can about this job and the field itself. 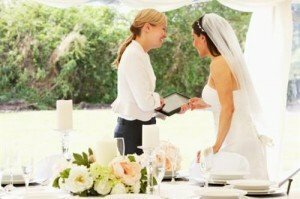 The job of a wedding planner can be very basic or quite extensive, depending on a number of factors, including the type of tasks the planner wants to offer. In most cases, these individuals work alongside an engaged couple, both sets of parents, and religious leaders to help create the special day that the two people have in mind. They must do this while maintaining a budget, meeting the demands of all vendors, and meeting a very strict schedule. With so many things to go, the job of a planner is often one that requires long hours, endless questions, and plenty of decisions to be made. In many situations, this will include finding vendors, establishing a budget for each expense, planning for fittings, meetings with professionals, and follow up calls with everyone that is part of the event. It means helping with things ranging from the cake to the hall to the timeline that the photographer needs to be available. Things like managing invitations and handling the out of town visitors can also fall onto the shoulders of this planner. Often times, this person will work in an office, but they spend a lot of time on the go from one vendor or establishment to the next. Many meet with clients in their own homes or may meet at a vendor’s location for a dress fitting, cake tasting, or tour of the facility. The wedding planner also has to ensure all bills are paid. There are no formal requirements for being a wedding planner. No state licenses are required in most situations. However, these professionals nearly always have to meet business license requirements set forth by communities or cities. Additionally, they may need to work with specific religious affiliations. There are educational opportunities for individuals who wish to work in this field. Though traditional college is not often necessary, programs that teach wedding planners how to do their job are available. According to the American Association of Certified Wedding Planners, individuals can learn how to do their job, build their business, and be successful in creating a career for themselves in this field. Being certified can help to make this possible. Certification through an organization like this can help the individual to work in his or her own business, but also in hotels and event centers that provide wedding planning services to couples. Many event halls and larger hotels with ballrooms now offer this type of service. Many people who work as wedding planners are certified as event planners. This means they can handle tasks ranging from planning corporate events to family celebrations on top of weddings. The demand for professionals in this field ranges. However, in many areas, this is one of the fastest growing fields in the service industry. According to the Bureau of Labor Statistics, individuals in this field are likely to see a growth rate of 44 percent in jobs between 2010 and 2020 in this field. This is an additional 21,200 jobs added to the field. People working in this field in 2010 earned a median pay of $45,260.